Featuring sleek iridescent glass shades, these hand-blown pendants offer a beautiful light, unique to your home due to the hand-crafted process. 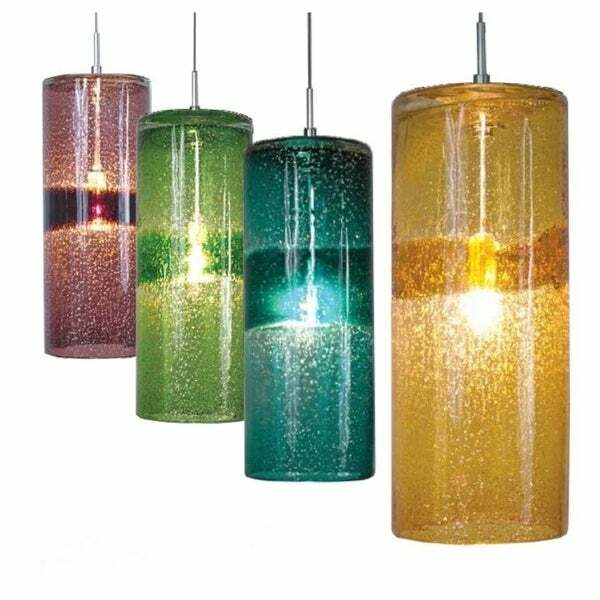 These cylindrical pendants are offered in a variety of colors and feature a gold-speckled accent band around the middle. Perfect for spotlighting, cascading pendants, task lighting and more, these lights will be the focal point of any room. Due to the handmade process, design may vary slightly. "The size on this also please"
Dimensions are: Shade: 4.75 inches wide x 4.75 inches long x 11.875 inches high. Canopy: 4 inches wide x 4 inches long x 2.5 inches high. Hanging wire length: 96 inches.